I never did anything impresive during my QBasic programming era. But at some point, once I knew C coding, I decided to come back to my old DOS programming environment and try to rotate a cube. 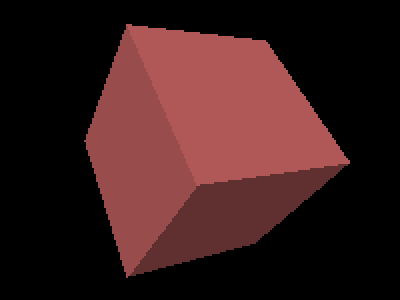 I didn't want to use any assembler routines, so what I did was to draw the cube in wireframe and then fill the inside with the regular fill() instruction. It worked out quite ok. The nicest trick is probably that I used not the regular 13h mode (320x200x256 colors) but the mode 7 (320x200, 16 colors). That allowed me to have fast swaping routine, and also to do some nice trick. For example, as long as my 3d objects didn't have more than 16 triangles (or faces), I could assign one fixed color to each of them, and then do the shading by changing the appopiate entry in the pallete table and simulate 256 colors. Neat! The code is bellow, I don't even want to have a look to it... Just... Enjoy if you can. I know it works, cause it still runs here in my XP machine. normal(i%).x = n.x / mo! normal(i%).Y = n.Y / mo! normal(i%).z = n.z / mo! Rota Vertice(i%), AuxVertice(i%), aX!, aY!, aZ! VScreen(i%).x = 160 + AuxVertice(i%).x * d! VScreen(i%).Y = 100 - AuxVertice(i%).Y * d! Rota Medio(i%), AuxMedio(i%), aX!, aY!, aZ! Rota normal(i%), AuxNormal(i%), aX!, aY!, aZ!